You have all seen the amazing sugar flowers that many cake artists make to decorate their cakes with. Have you ever wondered why we go through the extra time and effort to re-create Nature's Beauty? **1). Normal cut flowers are POISONOUS! The cultivation, processing and preservation of cut flowers involves the application of many, many chemicals most of which are still present on the bloom when it reaches you. Just a few include high-toxicity chemicals such as strychnine, nicotine, methyl bromide, and rotenone, metal sodium and dichloropropene. The industry recommendation is that cut flowers are NOT for edible consumption. Some studies have been done on florists who show toxic levels of these residues from touching the petals of these flowers. Therefore allowing the flower to touch a food product will quite easily introduce those toxins to the vulnerable young and elderly via consumption of cakes decorated with normal cut flowers. In addition, many species of flowers are in of themselves inedible, even poisonous, if ingested. **2). Cut Flowers require water. Without water the blooms will droop within hours, even minutes. Most florists will use tiny vials with a pierced plastic cap to hold a tiny amount of water near the stem. This is then shoved into your cake. Many times these leak, especially in warmer situations, and will destroy the cake around it into soggy crumbs. Sometimes it even leaks through buttercream/fondant exterior to make a huge, stained, weeping hole. **3). You can't keep cut flowers. Every time my husband brings me a bouquet of lillys (which I adore) I always go through a tiny moment of emotion that they are now dead, to give me pleasure. Your Big Day is something you will want to remember forever, and Sugar Blooms keep indefinitely in their original beauty, unlike your bouquet of cut flowers which can be dried into dust/spider traps at best. 4). Sugar flowers can match your colors - EXACTLY. No guesswork about the exact shade of your cut flowers, they can be made in any shade or hue. Some species of flowers are not available in certain hues or in certain hue combinations. With Sugar Flowers you can choose blooms in colors not seen in nature. Also some species are extremely delicate (orchids, hydrangea, etc.) and sometimes deteriorate on the actual cake. 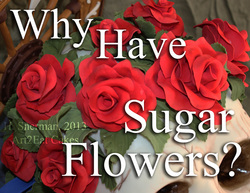 Sugar flowers are much much more durable. Most artists can reproduce almost any bloom, some are available mail-order. Art2Eat Cakes offers this, and delights in color-matching. Send me a swatch and name a species. While Sugar Flowers have many points over normal Cut Flowers, some just love the esthetic of a real flower. If you do choose to use cut flowers, many Organically Raised flowers are now available for use on cakes or for those with pesticide sensitivity. If you plan on using cut flowers on your cake, be sure to tell your florist what you plan to do, and that you want the ones raised without pesticides. Many florists will be happy to help, but some do not feel the pesticides on cut flowers pose any risk on a cake. In the end, it is your family and friends taking the risk. The young and the very old are the most vulnerable to toxic exposures, and have the most severe reactions. If you must use cut flowers on your cake, the best are those that you or a friend have grown, and that you KNOW pesticides have NOT been applied to. In addition, many naturally edible flowers are also available. Narcissus, Marigolds, Dandelions, Carnations, Honeysuckle are just a few, all of which would be both lovely and tasty! Some gardeners cultivate these blooms, many are available locally with a bit of research, or grow untended. Sugar Flowers are simply charming. Art2Eat Cakes can imitate or invent nearly any bloom to meet your wedding plan or color palate. There is no risk of water leaking into your cake or even destroying the decoration before you can take pictures with it. Sugar blooms last indefinitely. Add a air-tight display dome and they can join your wedding pictures as a lasting reminder of your Big Day! In the end, choose what will make your Day the most special and hassle-free for YOU!